“She had touched a dead person. Fear rippled like ocean waves in her body. She had to go! Run! Her body screamed at her to move. Here is a story for fans of both horror and the paranormal, a story that will transport readers to a strange world with ghosts and humans caught up in a dangerous game. The question is: who is doing the killing? The writing is sweet, highly descriptive, and loaded with a lot of images that will arrest readers’ minds. Lisa Acerbo knows how to entertain readers and her writing will capture their emotions of fear in a tight grip. The characters, as well as the setting, are perfectly crafted. 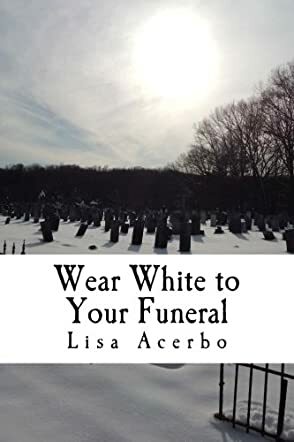 Wear White to Your Funeral is fast-paced and masterfully spun with many a big surprise for fans of horror and the paranormal.